Highest office yields globally recorded in Hanoi and HCMC, according to latest Savills report. Vietnam has proved again to be the market offering the most attractive office yields in the world, according to the latest Savills Office Yield Spectrum 2H 2017 report. Transaction volumes by overseas investors increased by between 1 per cent and 39 per cent in the first half of 2017 year-on-year, remaining in positive territory. The global search for yield has traditionally been one of the main reasons behind investment in the Asia-Pacific office sector. 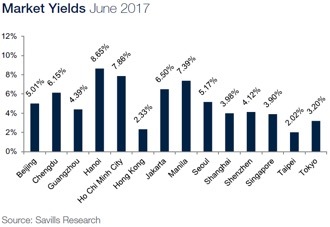 The Top 2 markets offering the highest yields in the world remained Vietnam’s gateway cities: Hanoi at No. 1 position with an 8.65 per cent yield and Ho Chi Minh City at No. 2 position, with 7.86 per cent. “Vietnam’s office market has shown excellent performance, particularly in Grade A, with occupancy rates reaching over 95 per cent in the CBDs of the two cities,” said Mr. Neil MacGregor, Managing Director of Savills Vietnam. “In light of various integration opportunities, economic reforms, and booming economic growth in the past few years, Vietnam’s economy has welcomed consistently increasing flows of foreign direct investment (FDI) into the country which, in turn, has helped secure sustainable growth,” he added. In hosting the year-long APEC Vietnam 2017 meetings, the country had a great opportunity to showcase its investment potential in 2018. South Korea, Japan, Singapore, Taiwan, and Hong Kong are some of the leading countries in foreign investment and are all members of APEC, proving the importance of this forum to Vietnam. As Vietnam’s economy thrives, the market will continue to see further interest in all real estate sectors, with a focus on office and hospitality, driven by increasing FDI, booming tourism and, more recently, industrial and logistics real estate developments. For three years running, optimism has dominated the Asian office sector as cheap money has continued to flood local markets and rents and capital values have continued to rise across the region. The increasing capital inflows have resulted in cap rate compression to decade lows but buoyant demand has inevitably led to more new prime office completions and vacancy rates are finally beginning to creep up. Investors have generally adopted a positive outlook for local office markets, their confidence bolstered by strong economic growth expectations. The most active markets have been China, followed by Japan and Hong Kong. However, limited stock available for sale in prime areas has meant that investors have increasingly turned their attention to development projects in secondary locations.